Bathed in the emerald waters of the Pacific, Vallarta offers you beautiful beaches ideal for relaxing, watching the stunning sunsets, and embarking on all sorts of water sports. Come and see for yourself! It is the most popular and easy-to-access beach in Puerto Vallarta, located right in front of the Malecón (Boardwalk). It stretches across the whole promenade offering a fairly strong swell, as well as golden sand–though a little rocky. You’ll be spoilt for choice in terms of the restaurants, bars, and nightclubs at every turn. The general public, especially recreational bathers who just want to sunbathe and play in the waves on the beach. Right in front of the Malecón de Vallarta (the Vallarta Boardwalk). 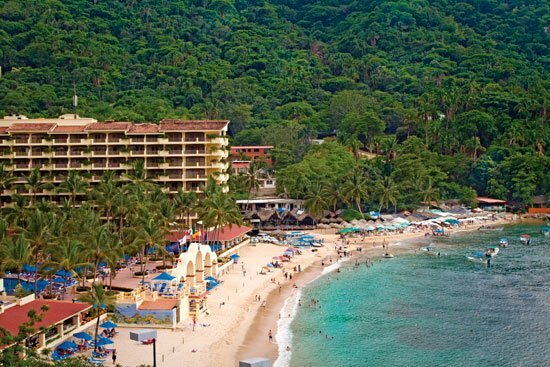 Located south of the center of Puerto Vallarta, this beach is famous because John Huston filmed his famous 1964 movie The Night of the Iguana here, featuring Hollywood stars Richard Burton and Ava Gardner. Today it provides a magnificent scenery of fine, golden sand and soft waves–often inexistent–combined with a spectacular background of intense greenery. Relaxing and water sports fans. Fans of parachuting can admire the impressive landscape from the air, with views of the Pacific Ocean framed by the dense vegetation of the Jalisco mountains. If you like adventure sports, don’t miss the zip lines offered along the Mismaloya river. Located half a mile from Los Arcos, at Km 11 on the road to Barra de Navidad. At nearly 820 feet (250 meters) long, this beach is a ‘natural spectacle,’ especially in the rainy season when the seawater forms a sort of barrage with the water from the lagoon, provoking the co-habitation of coastal and palm fauna, a sight to see for tourists and bathers. Relaxing, sun bathing, and kayaking, or exploring the shores of the beach up until the lighthouse. About 8 miles south of the center of Puerto Vallarta, along road 200. Slightly sloping, with fine grey-white sand and regular waves, this is the ideal beach for a number of activities, from observing natural nooks and crannies to sailing and sports fishing in the rental boats. You can only access this beach by sea (in a water-taxi or a tour from Puerto Vallarta). Water sports, kayak, and bird-watching fans, especially in the areas where palm, fig, and mango trees collect. For those in love, horses are available to rent for beachside walks. Found approximately 13 miles south of the center of Puerto Vallarta, between Tomatlán and Quimixto. This is a beach of fine, softly sloping sand and a regular swell. There is more than half a mile of uninterrupted contact with the water–with neither rocks nor obstacles–, blue-emerald warm waters, and beautiful landscapes of palm trees and exuberant median rainforest. Nature and water sports lovers. You can rent motorboats for water-skiing, scuba diving, and sports fishing. Another novelty is that you can only arrive by sea; what’s more, immersing yourself in the jungle, you will discover some paths that take you towards a magnificent waterfall more than 115 feet high, with palapas (open-sided thatch structures) serving food and refreshments nearby. You can also rent horses, an excellent way to explore the surrounding estuaries. South of Puerto Vallarta, following federal road 200, between Quimixto and Pizota.